I may be a broken record on the subject, but in my virtual art history wanderings, I come across so many artists who have been significant in some aspect of the history of art, and yet they are not generally known about. What is always fascinating to me is the connections they have with the “greats” of art history, and how it affected their work. Take Edna Andrade, for example. A fascinating artist, she developed her work in what has to be one of the seminal periods of twentieth-century art, the 1940s and 1950s. She’s absolutely brilliant, and I would like to share some of her work with you. Andrade once commented that her works were meant to be totally visual. In other words, there is no narrative or story to go with them. 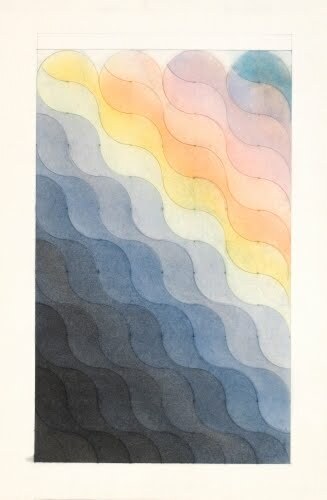 It’s interesting that her Op Art pieces were also influenced by architecture, philosophy, mathematics, and design. One can certainly see the latter two disciplines in her work. I think another big influence on her work was the 1965 show “The Responsive Eye” at the Museum of Modern Art. That show featured works by artists such as Bridget Riley (born 1931), whose black and white illusionistic paintings I’m certain Andrade saw. Born in Portsmouth, Virginia, Andrade’s parents encouraged her to draw and paint from the age of eight. She achieved a BFA from the University of Pennsylvania and an MFA from the Pennsylvania Academy of Fine Arts in Philadelphia. After her studies, she taught art at the elementary level in Norfolk, VA. While travelling after World War II (1939–1945), Andrade became acquainted with Bauhaus abstraction and German modernism. Bauhaus influenced her strong emphasis on design, color, and abstraction. In much of her early work, Andrade shows the influence of Surrealism and Cubism. 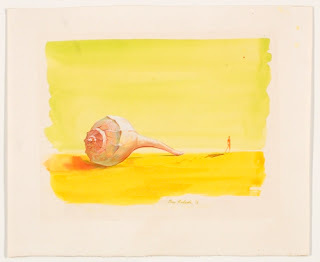 A large part of her early body of work included watercolor collage and ink drawings of abstracted landscapes. In the 1950s she painted abstract, geometric works in a limited palette. 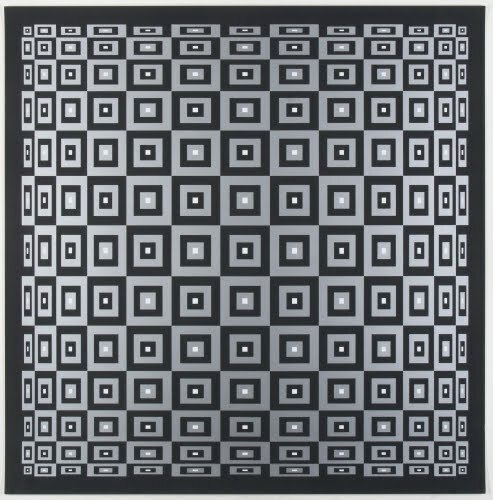 This interest in precision and geometry led to her interest in Op Art in the 1960s. Influences on her style included Paul Klee (1879–1940), Piet Mondrian (1872–1944), and Bauhaus geometric abstractionist Josef Albers (1888–1976). 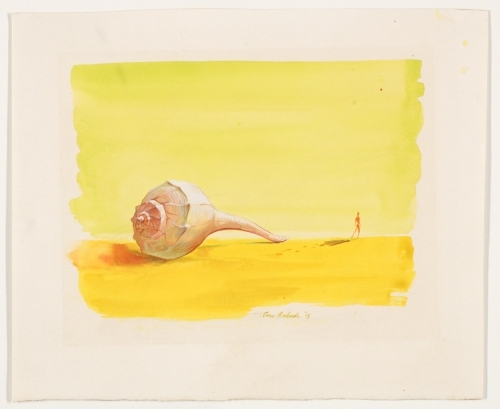 This early work suggests the work of Salvador Dalí (1904–1989), and the influence of Surrealism. 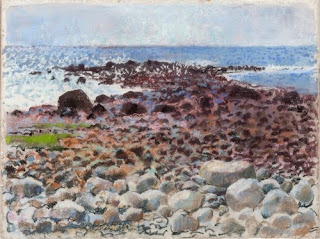 Even while experimenting with Surrealism and abstraction, Andrade continued to produce beautiful landscapes such as Cape Ann Beach. 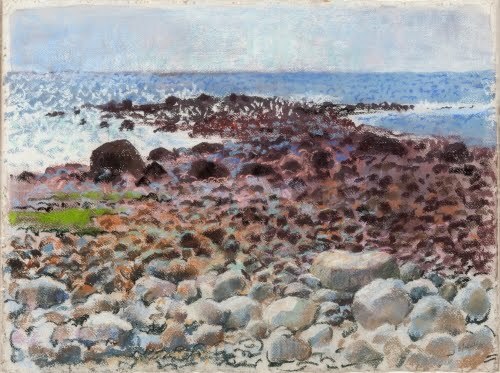 In her treatment of the rocks that dominate this work, one can see how she began to section elements of a composition—in the case of this work, the rock forms—into an abstract configuration such as is seen below. 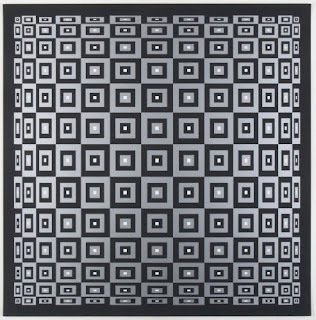 In her fully-developed Op Art pieces like this, Andrade’s work definitely takes on an aesthetic similar to that of Riley, and particularly Victor Vasarely (1906–1997).